Whales are cool but dolphins are alright too! This is a page dedicated to the questions of inquisitive young minds (and old!). Inspired by the class of Division 8 at Sperling Elementary School, Burnaby BC. In May 2012 my cousin invited me into her grade 3/4 class to talk to her students about whales, dolphins and porpoise. I told stories on everything from where I grew up and how I was rubbish at math (I still am) in school, to how the minke whale got its name and why some Antarctic killer whales are a funny colour! In one hour I had been bombarded with questions, not all of which I had answers for! The interest and engagement of these kids was inspiring and I was sad that we ran out of time. On my way home from the school that day an idea popped into my head, why don't I create a place where kids, or anyone of any age can send me a question for me to answer? So this is what I have done, I have created this page for you; for all of you youngsters out there who have questions about whales, dolphins, being a marine biologist, what it is like to be a scientist etc etc. I will post your questions along with my answers to this page (and if I can't answer your question myself I shall find others that can). If you send me your artwork I will post this too!! The North Pacific Right Whale, there are likely fewer than 50 remaining in the North Pacific. 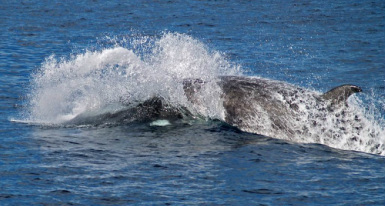 Which whale swims the fastest, the minke whale or the blue whale? The minke whale.... small but speedy! Check out this picture of a minke escaping from transients, this is a whale we see every summer in the waters between San Juan Island, WA and Victoria, BC. We have called this whale "Chrissy Hein" (We nearly always see her out on Hein Bank in the Strait of Juan de Fuca). Answer: No, porpoise are not dolphins. Dolphins belong to the family Dephinidae, while porpoise belong to the family Phocoenidae. 2) What is the difference between dolphins and porpoises? Answer: Dolphins and porpoises look very different. All porpoise are small (250 cm or less in body length). Their heads are different shapes; dolphins tend to have more elongated heads compared to porpoise. But the key difference is in the shape of the teeth;porpoise have teeth shaped like little spatulas. Porpoise also grow much faster than dolphins and reach maturity much earlier than dolphins. But dolphins live much longer than porpoise, most porpoise will not live longer than 20 years. 3) what is the largest type of dolphin? Answer: The largest species of dolphin is the orca, or Killer whale. 5) How many rows of baleen does of a humpback whale have? 6) How can I get a head start in becoming a Marine Biologist? Well OO, I think you are already doing a pretty good job on that head start! But as you get a little older, say in your mid teens you can start to think about the subjects that are really key to becoming a marine biologist, such as biology (of course! ), chemistry, maths, and maybe some languages so that you can go work in different countries. But aside from what to study at school you can look for volunteer opportunities and internships (though you will have to wait wee while yet for these). In the mean time persevere and learn what you can as this will better prepare you down the path when you are starting university or college and looking for those extra opportunities. 1) What do I need to do to become a trainer with the dolphins? Answer (from Dr. David Rosen): Many dolphin trainers have a University degree in biology. 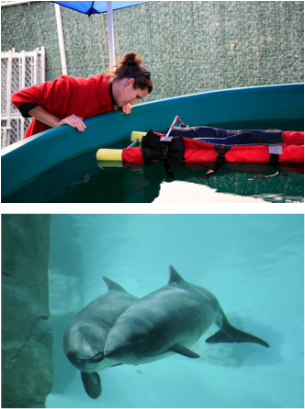 Nowadays, most trainers start off as volunteers or interns at an Aquarium to gain experience, and there are also a few research facilities that offer dolphin training classes. 2) Do you need to be a strong swimmer to study about the animals in the oceans? Answer: If you want to work anywhere near, on or in the water then you really really want to be a strong swimmer, just in case you should fall in! 3) Which university is the best to study at? Answer: Which university is the best for depends on many things, such as what do you want to major in, how far away from home you want to go etc etc... in my case I wanted to go to a university that was by the sea (perhaps not the most academic of choices but luckily for me I ended up at a really good university in the North East of Scotland, Aberdeen). It was far from home but it was by the sea and I was able to study what I wanted to study so this was enough for me! 4) Do you have to dissect the animals? Answer (from Dr. David Rosen): Trainers do not have to dissect the animals they work with.When an Aquarium animal dies, the vet staff perform an examination to determine why. The manager of the Vancouver Aquarium's marine mammal rescue centre monitors the young harbour porpoise Jack after he was brought into their facility in September 2011. The baby porpoise was reported stranded in Horseshoe bay, but after being successfully nursed back to health the young animal has now joined Daisy (Vancouver Aquarium's resident harbour porpoise). 5) Do you have to stay overnight with the animals when they are sick? Answer (from Dr. David Rosen): Usually, trainers keep an eye on an animal overnight when it is very sick since they know the animal the best and can let the vet staff know if anything changes. Since trainers have a very strong bond with the animals, so it is often difficult to keep them away when an animal is ill.
1) How many bones does a blue whale skeleton have? To answer this question I went to the expert in blue whale bones! Mike DeRoos, a master skeleton articulator. Mike told me that on average a blue whale has approximately 180 bones... but this varies a little from animal to animal. For those of you in Vancouver drag your parents out to UBC to see a real blue whale skeleton hanging in the Beaty biodiversity museum. And to learn more about marine mammal skeletons check out Mike's website www.cetacea.ca!! Check out this fab art work!! Send me a question and I will do my best to answer it it. Also, if you would like me to share your artwork email me the image and I will post it along with your questions.... so get thinking and get creative!